New home sales annual rate topped 321,000 in January 2012 and except for December’s revised figure of 324,000, this is the highest level since the end of the home buyer tax credit in April 2010. The month-to-month rate fell less than 1 percent but that was due to the upward revision in December’s rate. Sales increased 11 and 9 percent respectively in the Northeast and South but were down 25 and 11 percent in the Midwest and West regions. The South’s level of 188,000 (seasonally-adjusted annual rate) was also at a level of sales not seen since the end of the home buyer tax credit. The inventory of new homes for sale established another record low at 151,000 homes, which represents a 5.6 month supply at current sales rate. Anything below a 6 month supply is considered very healthy and could indicate a shortage in some places. 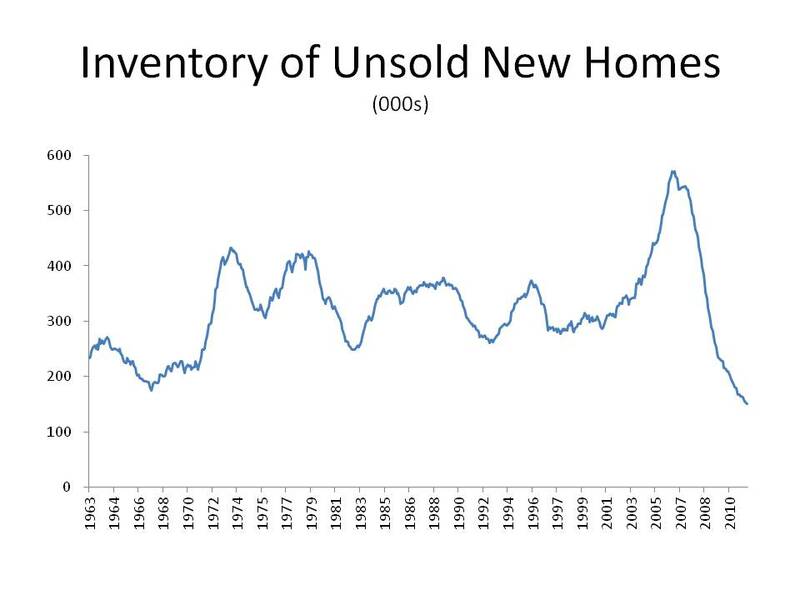 The number of completed homes for sale also reached a new record low of 57,000 homes. The median sales price fell almost 10 percent from January 2011 to $217,600 but that may be due to the increase in sales in the South where homes are less expensive and to an increase in the proportion of homes sold in the lowest price range. The modest trend increase in new home sales aligns with similar increases in existing home sales, new single-family home starts and permits and more general economic trends such as GDP, employment and consumer confidence improvements. The continuing but relatively slow improvement will result in a forecast of 360,000 new home sales total in 2012. February 16, 2012 - More than 51,000 builders, remodelers and other members of the home building industry crowded the aisles of the National Association of Home Builders’ International Builders’ Show (IBS), which ended its four-day run Friday at the Orange County Convention Center in Orlando, Fla., last week. Signs of optimism for the industry’s recovery could be felt throughout the show, as exhibitors noted increased booth traffic and solid sales leads. “We were so happy with the show this year—it was truly unbelievable. We barely had time to take a break,” said Brian Stowell, CEO of Crown Point Cabinetry, who noted that they will exhibit again at IBS 2013 in Las Vegas. "If you supply the construction trade, you are crazy if you don't have your product here. This is your one chance all year to get in front of a national audience of builders that have projects. This show is a must for us." The 2012 IBS featured exhibits from more than 900 suppliers representing all facets of the home building industry. Builders and remodelers also attended more than 165 educational sessions on design trends, green building, marketing, remodeling and other building industry topics. Nearly 2,500 people attended a special address by Federal Reserve Chairman Ben Bernanke, where he discussed how restraints on credit for home buyers and home builders alike continue to impede the housing and economic recovery. Attendees also flocked to IBS Live, a new theater-like venue on the show floor that featured several exciting sessions throughout the week including an appearance by “Dancing with the Stars” winner and Operation Finally Home spokesperson, J.R. Martinez; a live airing of the popular Los Angeles-based radio show, “Home Wizards;” and a number of presentations on topics like green building, consumer trends and home financing. “We really enjoyed our experience at the 2012 IBS. We were able to meet with vendors and see the latest product innovations, attend a wide variety of education sessions to learn new ideas and sharpen our skills, and hear from a great line-up of speakers, said Steve Spanjer, President of Spanjer Homes. “We returned to work recharged and inspired. The IBS is an event our firm will not miss, as it helps enable us to be better prepared builders.” Other highlights of the show included The New American Home 2012, NAHB’s official show home, and the IBS Opening Ceremonies featuring world-famous magicians Penn & Teller as keynote speakers, and Aron Ralston, whose inspiring story of bravery was made famous in the acclaimed movie 127 Hours. The next International Builders’ Show takes place Jan. 22-24 at the Las Vegas Convention Center. Registration for the 2013 show will open on Sept. 1. Details will be available at www.buildersshow.com. To view photos from the 2012 IBS, please visit: www.buildersshow.com/photos. Choose From More Than 400 House Designs and House Plans We offer house designs in a wide range of styles and sizes. Some of our more popular house designs include European-inspired Georgian and Palladian homes, English Manor house plans, Tuscan-style Italian villas, French chateaux, and Colonial house plans. Our Tuscan-style villas range from 1800 sf to 13,600 sf. Our Newport Classics house designs are gentrified New England-style cottages that range from 1500 to 5000 square feet. Our starter castles, mansions and estate homes are designed in the grand tradition of some of the most impressive homes in the world. Please feel free to search our house designs or browse our photo gallery to get a sense of the many styles and types of house designs we offer.